Wet pavement, particularly just after it starts to rain and before surface oil washes to the side of the road. Gravel roads, or places where sand and gravel have collected on paved roads. Lane markings and steel plates and manhole covers, especially when wet. Reduce Speed—Slow down before you get to a slippery surface. Your motorcycle needs more distance to stop on slippery surfaces. By going slower, you can stop and turn more gradually, reducing your chances of skidding. It is particularly important to reduce speed before entering wet curves. Avoid Sudden Moves—On slippery surfaces, any sudden change in speed or direction can cause a skid. Speed up, shift gears, turn and brake as little and as smoothly as possible. Use Both Brakes—Don’t be afraid to use the front brake as well as the rear brake. The front brake is still more effective than the rear brake, even on a slippery surface. Just be careful to apply it gradually and avoid locking up the front wheel. Don’t squeeze the brake lever too hard. Avoid Slippery Areas—Try to find the best surface available, and use it. Under normal conditions, riding on the grease strip is not dangerous. However, the grease strip can become dangerous when wet. When it starts to rain, move out of the center portion entirely, and ride in the tire tracks left by cars. Often, the left tire track will be the best position. However, you should change your lane position for traffic and other roadway conditions as well. Watch for oil spots when you stop or park. If you put your foot down in the wrong place, you may slip and fall. Dirt and gravel tend to collect along the sides of the road—especially on curves and ramps leading to and from highways. Stay away from the edge of the road, particularly when making sharp turns at intersections and when getting on or off freeways at high speed. Rain dries and snow melts faster on some sections of a road than on others. Try to stay on the driest, least slippery part of the lane at all times. Safe riders wouldn’t even consider riding on roads covered with ice or snow. However, you may find yourself on a road with scattered patches of ice or snow. Patches of ice tend to crop up in low or shaded areas and on bridges and overpasses. You may also encounter, from time to time, wet wooden surfaces or wet leaves in the fall. These are just as slippery as an ice patch. Avoid all of these surfaces if at all possible. If you can’t, keep your bike straight up and proceed as slowly as possible, letting your feet skim along the surface so you can catch yourself if the bike starts to fall. Be sure to keep off the brakes while you are on a very slippery surface. Slow down to reduce the jolt. Make sure the motorcycle is straight up. Rise slightly off the seat with your weight on the foot pegs so you can absorb the shock with your knees and elbows. Rising off the seat will cut your chances of being thrown off the bike. However, controlling the throttle can be somewhat tricky. Practice this technique in a safe area (such as a deserted parking lot) before you try to do it on-street. If you ride over an object on the street, it’s a good idea to pull off the road and check your tires and rims for damage before going any further. to take tracks head-on can be more dangerous than crossing at an angle—it may carry you into another lane of traffic. 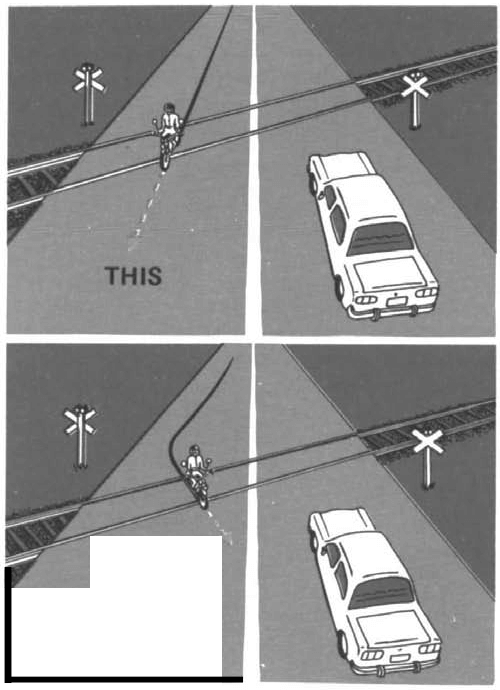 To cross railroad tracks safely, move far enough away to be able to cross them at an angle of at least 45º. Then, make a quick, sharp turn across. Do not try to edge across. The tracks or seam could catch your tires and throw you off balance. You do need to change direction, however, to cross something that runs in the same direction you are going. For example, you may wish to cross trolley tracks, ruts in the middle of the road, or pavement seams that run parallel to your course. 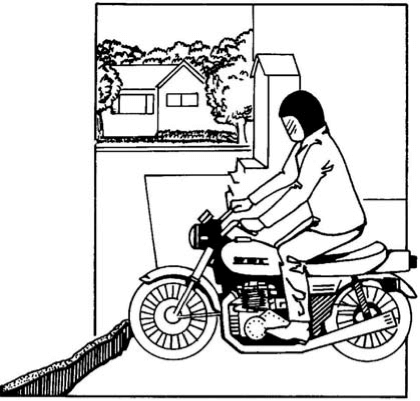 When you ride over rain grooves or metal bridge gratings, the motorcycle shakes. It’s an uneasy, wandering feeling, but it’s generally not dangerous. The best thing to do is relax, stay on course, maintain speed, and ride straight across. Some riders make the mistake of trying to cross these surfaces at an angle. This may reduce the uneasy feeling, but it also forces the rider to zigzag to stay in lane. The zigzag is far more dangerous than the wandering feeling.